Price Drop! Was: $379.99 Now: $99.99. For a limited time only, while stocks last. Like millions of Americans, you may not have the time necessary to keep a good exercise routine at a gym and still complete your daily responsibilities. If you are worried about this and still would like to keep healthy and lose weight, you should try this Genki vibration machine with a remote controller. This vibration machine can vibrate up and down with 120 adjustable speed levels. In addition to this, three vibration modes including walking, jogging and running give you the same effect as exercising outdoors. From P1 to P10, there are ten auto running programs for you, too. The LCD featured allows you to keep track of time, the mode settings and the speed level with ease. This vibration platform is suitable for people who don't have the time or don't want to spend thousands at a gym. The silent mode allows you to exercise even in the dead of night without waking your neighbors or family. The overload protection as well as the anti-static and anti-jamming circuit protection enhances safety - keep your worries at bay. 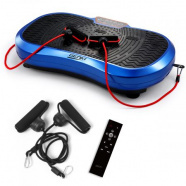 Made of ABS plastic painted in scratch-resistant piano paint, this vibration plate is good-looking and long-lasting. As a bonus, you receive two sets of resistance bands, a remote control and a mat. Stop wasting money and time - keep fit at home! 26.5" x 15.5" x 5.5" approx. 30" x 17.5" x 8" approx. Great quality. Help me tremendously with my knee injury. Great product.